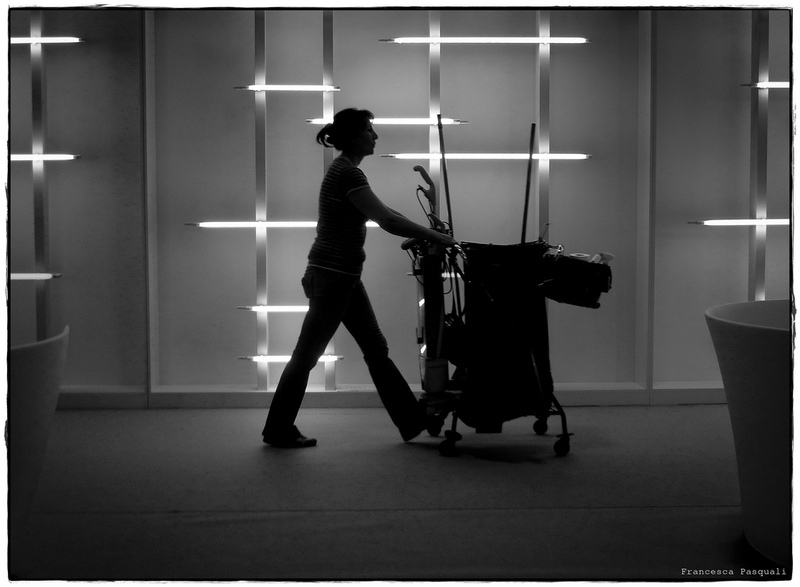 I first get a glance of her as she makes her way down the hallway, pushing her cleaning cart. “Hola, como esta?" I say in Spanish. She tells me she’s fine and is ready to call it a day. Some days this will be our only encounter, and other days, I will purposely place myself at the break room or in the hallway, in hopes I get to tell her goodbye one more time. The cleaning lady at my job, not only reminds me of my mother but she also reminds me of myself. It's been twenty-six years since my mother made the grueling journey of crossing the border in search of a better life. The financial and political distresses in Mexico left little room for a life of joy and job opportunities. Once settled in Texas, one of my mother’s first jobs was housekeeping at a local motel. Since she had no one to look after me, I would tag along. I'd knock on the door, "house keeping!?" and at the sign of no response, I would eagerly enter the room. I was about four years old, and yet I can still recall our daily routine, the color of the sheets and room layout. My mother would continue in this line of work for years, eventually moving on to cleaning houses. I have fond memories of playing in strangers’ living rooms, play grounds, and backyards. There was this one time we house-sat for a prominent Dallas lawyer over the weekend. I woke up early to catch the Saturday morning cartoons. I grew up with basic cable, so this was the only time cartoons would be shown. I happened to flip through the channels and came across 'Nickelodeon.’ Boy was that a game changer! Cartoons all day? What world was this? That’s when I realized rich people had it made. So imagine me wearing an oversize t-shirt, eating a bowl of cereal and watching cartoons in a stranger’s living room all by herself. I was living my best life at five years old. As years went by, my mother moved on to cleaning offices in the downtown area. One summer, when I was seventeen years old, I needed cash for my senior year expenses. Of course my mom was not about to just hand over $800 overnight, so she made me work for it. While my friends were getting summer jobs at local pizza joints and nearby shoe stores, I was helping her take out trash and vacuum offices for hours. Our nights would begin by walking through metal detectors, before and after, to ensure we weren’t bringing any weapons or stealing anything. After arriving to our designated floor, we would start by emptying trash cans and dusting off desks. This alone took hours. But something caught my eye every night and it’s something I still look back to this present day. As I walked by the empty cubicles, I was captivated by the stories being told through family portraits, kid’s drawings and whatever decor people displayed on their desks. I wanted to know who they were and ask if they liked their job. Did they live in huge houses? What exactly did they do for this company? Are they currently having dinner and drinking wine at fancy restaurant? What kind of car did they drive? I would spend hours thinking about their lives and how far my reality seemed from theirs. The floor that fascinated me the most was the top floor, because on it was a Texas State Representative’s office. She had pictures of herself with Martin Luther King Jr., Rosa Parks and past Presidents. Months had gone by but she still had the memorial program of Coretta Scott King’s (MLK’s wife) funeral, who had passed away earlier that year, sitting at her desk. I’ll admit, I went through it a couple of times. I became a dreamer in that hotel room and that stranger’s living room. Now here I was still a DREAMER in disguised. I knew that my situation would not afford me a job opportunity at an office like this. My job would always be behind the scenes, after everyone's gone home. More than twelve years have gone by and I still look back at those late nights. Vacuuming an entire floor was torture, I don't miss that. Now I work at a huge office, surrounded by cubicles. People continue to display pictures of their kids, and husbands, along with drawings and small decor items to show their personalities. It’s not the glamorous job I had envisioned, but to my seventeen year old self, it's the job I believed I was never worthy of having. A very special shout out to my friend, Alison Bermea (@ZolchiRonnie), who is an aspiring writer and helped me edit this post. I added a few things to the final version, so all errors are mine. Please be nice and enjoy!